Me and MyConnie is now a book! I was asked to relate my story of getting back into motorcycling by a company that makes self-publishing software: blurb.com. 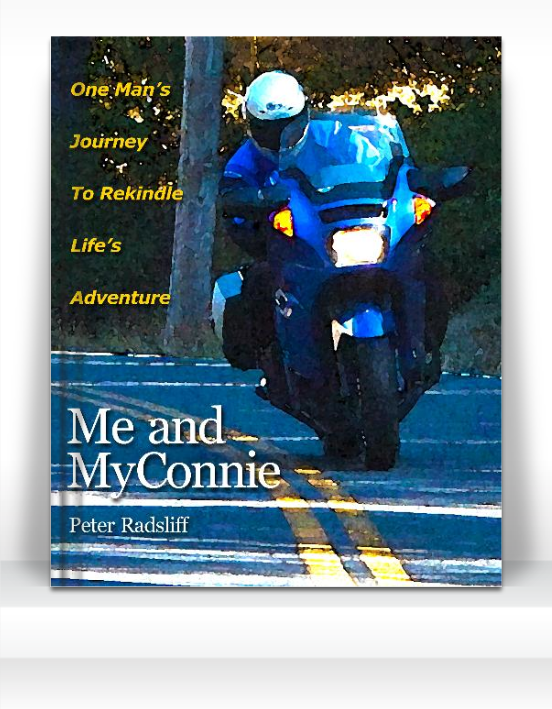 So for the past month, I have been re-crafting the stories related in this blog plus adding ride videos and photo slideshows for an enhanced eBook version of Me and MyConnie, made for iPad. This is the first time I have published a book, although I have written professionally before. In the 1990s I wrote a monthly column in OceanSports International magazine called “Dive Jive” and was sent by the magazine’s publisher to Fiji to review and photograph seven different dive resorts. Plus, as a marketing professional my entire career, writing has been an important part of my daily work. However, though I am no stranger to a word processor, going through the process of telling a story in book form was interesting and new for me. The enhanced eBook format for iPad is fascinating because you can insert videos, photo slideshows and links to other media making the process of reading a book much richer. And the Blurb.com software makes this process surprisingly easy. However, creating a book is one thing, getting anyone to take notice is another. Blurb shines there as well. They make it easy for people to find and download new titles with their own online bookstore located at blurb.com/bookstore. It’s a great way to browse and discover new eBook titles from interesting authors, most of whom are outside the mainstream of the publishing world. Another great benefit to authors is that Blurb makes it easy to publish to Apple’s iTunes book store which then broadens the audience greatly. The image above was grabbed from Blurb’s enhanced eBook gallery web page. Me and MyConnie will be free the first two week of publication, Nov. 5 – 19, 2012, in the Blurb bookstore. After that, it will be available for purchase for a nominal cost. Here are links where you can preview the first 27 pages of the book on your computer or tablet, and also a link to download it for your iPad. I hope you enjoy it!